As any Christian knows, just dropping your children off at church once a week is not enough to give them a faith that will sustain the challenges of modern life. Mormons believe that church teachers are meant to support parents, not to replace them. Mormon home life is Christ-centered and provides many opportunities to learn the gospel. For most Mormons, the day begins with prayer and scripture study. Each person is encouraged to have a personal prayer each morning and evening. Couples are taught to begin and end their days in prayer together as well. Then, the entire family gathers together for a family prayer each morning and evening. This is often combined with the family scripture reading time and devotional. 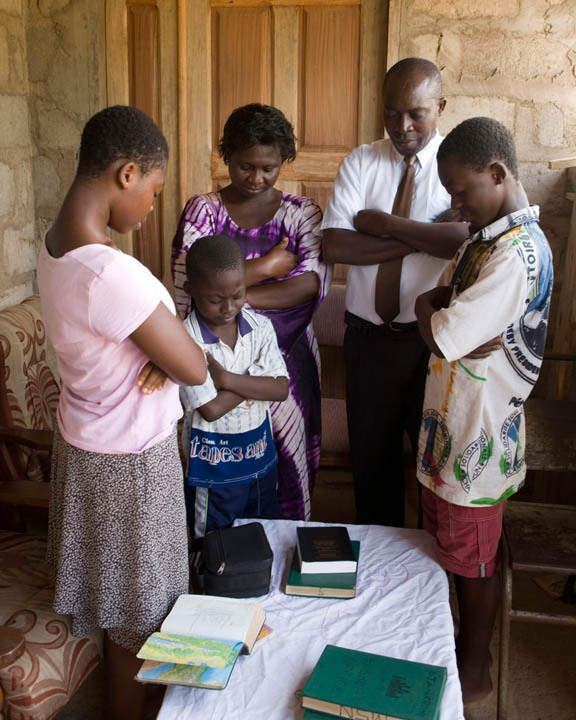 Although scripture study at church follows a set rotation (for those eight and older, two years of Bible study, one of Book of Mormon study, and one of Church history and Doctrine and Covenants) at home, families and individuals study any way they choose. In families with small children, the scripture reading will often combine readings from the children’s story books with the same material from the regular scriptures. Most families have members take turns reading. Even the youngest children are expected to listen to the adult scriptures being read in order to become familiar with the language of scripture as soon as possible. Children who can read do so from their scriptures at a young age. Each individual member is also asked to study the scriptures daily on his own. Again, they choose their own schedule and pattern of study. Some read quickly, some read slowly, and some read by topic while others read the material in the order it is published. They are taught not just to read, but to ponder the scriptures and to understand how they apply to the reader’s personal life. One evening each week, most often on Mondays, the entire family gathers together for Family Home Evening. This is one evening that no one schedules sports, lessons, business meetings, or friends. Instead, the family spends time alone. They have songs, prayers, scripture reading, a brief lesson of their own choosing, games, crafts, service projects, and usually a special dessert. The evening makes memories, bonds the family, and gives them an opportunity to share their religious beliefs within the context of the family. Since most families have the members rotate responsibilities for the meeting (conducting the meeting or the music, praying, teaching, planning and so forth) the children learn important skills that make them better able to serve in the community and in their church. Where else does a three-year-old get to teach a lesson or lead a song? Mormons don’t believe religion is something that happens for a couple of hours on Sunday and then gets forgotten the rest of the week. This means every aspect of their life is centered on the teachings of Jesus Christ. Even when they are washing dishes, working in an office, or at a baseball game, they are expected to live their religion. Mormons have fun and work hard, but they do it within the guidelines of their faith. They won’t drink alcohol, coffee, or tea, they avoid course language, and they try to be honest in their doings. They strive to treat others lovingly and to look for ways to serve. This holds true even—or especially—in their own homes. Mormons are taught to treat their families very well. They are respectful of one another, they look for ways to serve, and they make time for one another. Because they believe their families will continue after death (because who can be happy in Heaven without the people he loves most?) they work very hard at building a family worth eternity. Mormon home life may not be perfect, but the family members are always working towards an eternal life with God and with one another. How Do Mormon Children Live?